Eydis Fire-Eye is a Nord master-at-arms and a Guardian for the Fighters Guild. Eydis Fire-Eye can be found upstairs at the Guild of Fighters in Balmora. She is one of five people in Vvardenfell who can provide admittance into the Fighters Guild, and also assigns orders to Guild members. Eydis also provides major training in Axe and Blunt Weapon, and medium training in Long Blade, to Fighters Guild members of Protector rank and higher, and is, in fact, the second highest Axe trainer in Morrowind. She is a pious worshipper of the Daedric Prince Clavicus Vile and she serves the Camonna Tong. Eydis wears a bonemold cuirass with matching pauldrons, greaves, boots, tower shield, and bracers. She wields a Dwarven mace and carries up to 50 gold. Aside from her natural resistance to shock, immunity to frost, ability to shield herself, and a natural frost damage spell, Eydis knows no spells. "Have you taken care of that cave rat problem yet? Surely you can handle even that." "What's the status on those egg poachers, %PCRank? Don't make me assign this to another person." "Do you have more information on the Telvanni agents? I need to know." "Have you recovered that code book yet? I've been waiting too long for it." "Did you recover the debt money from Desele yet? Or have you just been wasting time? Well?" "Give me the status on Dura gra-Bol. Surely you haven't botched up this mission, have you?" "I sent you to investigate some orcs [sic] at a Daedric ruin. What have you found out, %PCRank?" "Tell me what is happening with that Verethi gang. I'll assume you've taken care of it?" "Did you find time in your schedule to visit the Sarano tomb yet? Give me the status." "He's Thieves Guild, a Wood Elf. The Telvanni prefer to hire Nords and Wood Elves when they can't get natives. I know nothing about him. But this is not a Thieves Guild job, so he has no protection." "She's not a problem any more." "She's been expelled from the Fighters Guild. She stole from her Guild Steward. She's stupid, but she can fight. She joined the Thieves Guild when we kicked her out, but she's nobody important. This Caldera Mine trouble is not a Thieves Guild job." Balmora Fighters Guild: "You are in the Balmora Guild of Fighters now. I am the Guild Steward." "So you think you can bribe me to betray Sjoring Hard-Heart? Well, you might be right. If you give me the Bitter Cup, I'll pledge my support to the Thieves Guild." "I know that some gifts of Clavicus Vile can be hard to part with. If you change your mind, you know where to find me." "So be it. I take this Bitter Cup and pledge to support you against Sjoring Hard-Heart. I never liked the way the Camonna Tong was using an Imperial Guild to destroy another Imperial Guild. Tell the Master Thief to contact me when he's ready." "Yes, you gave me the Bitter Cup. I have not forgotten." "Go to Drarayne Thelas' house. It's here in Balmora, along the river on the east side. Ask her where the rats are coming from. Kill the rats and get your payment from Drarayne Thelas. Report back to me once you've taken care of this." "So you killed the rats, %PCName? Not bad...for you. You ready for more orders." "Well, the first job is a bust, %PCName. I've learned something unfortunate happened to Drarayne Thelas. Are you ready for more orders?" "There's nothing more to say about that." "They're southwest of the town of Caldera, I believe. Check around when you're in Caldera. They'll give you better directions." "The code book our client wants is in the hands of Sottilde at the South Wall in Balmora. Find that code book and bring it back to me." "I'm glad to see that code book, %PCName. Hand it over and I'll get your payment." "You already have the code book? You have good instincts. Well, just hand it over and these 50 septims are yours." "I'm not paying any more than 50 septims. Don't make this difficult, %PCName." "Here's your 50 Septims, %PCName. The guild needs more like you -- obedient and efficient. If you want more orders, just ask." "Don't go mentioning code books, %PCName. It's unhealthy." "Since you brought me the Bitter Cup, I'm not working against the Thieves Guild anymore. You have my word." "You've been expelled from the Fighters Guild. Until you make amends, I cannot discuss contracts with you." "Helviane Desele runs a cornerclub in Suran. She owes Manos Othreleth, one of our clients, 200 septims. Bring this money to me and I'll let you keep half of it." "You killed Helviane Desele? Well, that's the way it is sometimes. Some people won't pay their debts." "Good work, %PCName. Here's your share." "Do you have the 200 septims Desele owes our client?" "I'll pass any debt collection contracts your way." "This Orc is an outlaw, living openly in a house here in Balmora. 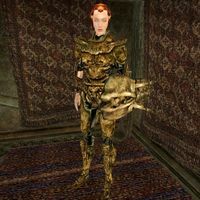 I have a contract here that says 250 septims are yours if you bring her to justice." "I heard that Dura gra-Bol is dead. Here's your 250 septims." "You already killed Dura gra-Bol? Well, then, these 250 septims are yours." "I don't have any more bounty contracts right now." "Yes. Egg poachers. May sound silly, but those kwama eggs are among the few things worth exporting from this nasty little province. Dram Bero, the owner of Shulk Egg Mine, wants to make an example of these thieves to keep other miners from getting funny ideas. The egg poachers, Sevilo Othan and Daynila Valas, are former egg miners, and long-time local troublemakers. You can handle that, can't you? Report back when the poachers are dead." "Have you taken care of those egg poachers yet?" "You got both of them? Good. Here's your payment. 100 septims. And we've got some extra potions from a recent raid. Take these. They'll come in handy. Just tell me when you're ready for more orders." "You taught those poachers a lesson, %PCRank." "You've been expelled, %PCName. You'll have to make amends." "You want to join the Fighters Guild? I'm the steward here in Balmora." "It's simple, %PCName. The citizens give us duties and gold, and I pass some of them on to you. When you're ready for advancement, just come ask me and I'll tell you if you're ready or not." "Not very tough, as it turned out. Eh?" "She's [sic] Thieves Guild, a local Dark Elf. She's [sic] known on Azura's Coast. She [sic] could be trouble. But like I told you: this Caldera Mine trouble is not a Thieves Guild job." "Duke Vedam Dren himself gave us a contract to take care of the problem. Go to Alof's Farm northeast of Pelagiad and just north of the Arvel Plantation. Alof can tell you where the Orcs are and what needs to be done." "If you already killed those Orcs, why did I get this contract? Well, rules are rules. Here's the 500 septims, your share of what the Duke paid." "Alof says the Orcs are gone. Here's 500 septims for the Duke's contract." "Duke Vedam Dren himself gave us a contract to take care of the problem. Go to Alof's Farm northeast of Pelagiad.... What do you mean Alof is dead? What were you thinking, %PCRank? Well, the contract still needs to be filled. Apparently, our only source of information is dead, so you'll just have to search the area until you figure out which orcs to get rid of. Check for any ruins nearby; it'd be a good place for them to hide out." "You made the Fighters Guild look good for the Duke, %PCName." "I have a very simple contract to end an infestation of cave rats. You might be able to handle it." "A local egg mine has problems with egg poachers. And you're going to solve those problems." "We have a contract from the Caldera Mining Company to kill four Telvanni agents responsible for trouble at the Caldera Mine." "I need someone to return a code book that belongs to our client." "Helaviane [sic] Desele owes one of our clients 200 septims. Deliver Desele's debt money to me." "I have a bounty contract for the Orc Dura gra-Bol." "I don't have orders for anyone under the rank of Protector. Find out what you need for advancement. The Guild Stewards at Vivec City, Sadrith Mora, or Ald'ruhn might have some work for you in the meantime." "Alof the Easterner has seen Orc outlaws near his farm. I have a contract from Duke Dren himself to investigate the Orcs at a Daedric ruin." "A distinguished client has placed a contract on the Verethi Gang." "There is a dangerous creature loose in the Sarano Tomb." "I don't have any more orders for you, %PCName. Try asking the Guild Stewards at Vivec City, Sadrith Mora, or Ald'ruhn." "What can I do for you, Guildmaster?" "A Hunger has violated the Sarano Tomb. Go to this tomb, which is over the hills southeast of Fort Moonmoth between the Ashlands and Lake Amaya, and kill the Hunger." "You already killed the Hunger? Then take the 1000 septims for this contract." "I am sure the Sarano family is grateful. In the meantime, here's some more tangible gratitude: 1000 septims." "Everyone is grateful to you for clearing the Tomb of the Hunger." "She's Thieves Guild, a local Dark Elf, no one important. And this Caldera Mine trouble has nothing to do with the Thieves Guild." "Four Telvanni agents are responsible for thefts and disappearances at the Caldera ebony mines. Their names are Alynu Aralen, Sathasa Nerothren, Fothyna Herothran, and Alveleg. They're hiding in a cave in the hills north of Caldera Mine. When the four agents are dead, report back to me. Take care, it's very likely that one of them is on lookout posted outside the mines. The quickest way to Caldera is probably to have the guild guide at the Mages Guild transport you, but it is your choice." "When the four Telvanni agents are dead, report back to me." "You got all four? Good. That'll make some people at Caldera Mining Company very happy. And here's 400 septims. The Caldera Mining Company pays well. And when your ready for more orders, let me know." "You've killed the agents already, %PCRank." "I told you, right? You slow or something? It wasn't a Thieves Guild job. And that's all water under the bridge, anyway." "I told you. This Caldera Mine trouble is not a Thieves Guild job. Yes. They are Thieves Guild. And if you belong to the Thieves Guild, and you murder a Thieves Guild member, you get expelled. But it's only murder if the crime is reported. And you're not going to report it, are you? And, after all, I'm your Fighters Guild Steward, and I'm giving you a job to do. Don't make me wonder about where your loyalties lie." "Our client wants the leader of the Verethi Gang, Dovres Verethi, killed. The Verethi Gang are smugglers based in Mannammu just southeast of Pelagiad. Kill Dovres Verethi and report back to me for 1000 septims." "Good work, %PCName. Here's the 1000 septims from the contract." "If you already killed Dovres Verethi, then I guess I ought to go ahead and pay you the 1000 septims." "The Verethi Gang won't trouble anyone anymore." Eydis Fire-Eye also appears in the Houses of Morrowind card expansion for Legends as the card Fighters Guild Steward.